Active aid to navigation, leased to the Trustees of Reservations. Accessibility: From May to October, the Trustees of Reservations offers natural history tours at Coskata-Coatue Wildlife Refuge. A naturalist guide leads participants on an over-sand vehicle tour through the salt marsh to learn about the geology, ecology, and history of the area and to climb the Great Point Lighthouse. 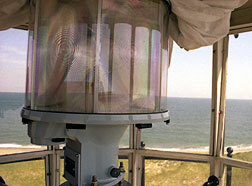 NOTE: Due to nesting piping plovers, the tours often don't go to the lighthouse until late in the summer.